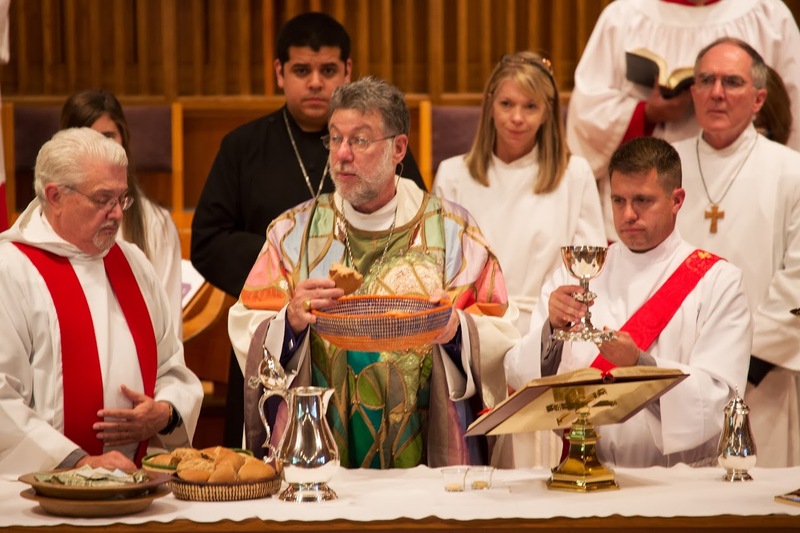 The Vergers Voice: Ordination in Oregon: What's a Verger to do? On July 6th, 2013, VGEC member and VGEC Facebook page manager Michael Sanchez participated in the "Ordination of Sean Scott Wall to the Sacred Order of Deacons" at Christ Church in Lake Oswego, Oregon (just outside of Portland). Bishop Michael J. Hanley presided over the event. "This was the first time I've been so involved with an ordination," Michael tells us. In the past, he's helped with providing music or simply came to support the ordinand. This time, Michael had a large role to play: Sean (the ordinand) asked him to be master of ceremonies. "We had a staff meeting at the church, and I sat down with Sean and the interim rector, and we looked over the service bulletin. At the outset, I knew I had two big challenges: we have a small chancel and there were a lot of people that needed to be seated. Also, with the visiting clergy, this was by far the largest processional/recessional that I've ever had to manage!" After meeting with Sean and the Interim, Michael set out to work, drawing maps, diagrams, and making out seating cards. The day before the ordination, he came to the church and made signage for visiting clergy dressing areas, marked off pews, and made a small packet of the aforementioned diagrams, maps, and seating arrangements: one for him and one for the Interim. "The day of the ordination was a lesson in flexibility," Michael laughs. "Of course, when you plan something out, you always have to remember that the presider or celebrant - in this case, the Bishop - will have the final say, so you can't get too attached to your master plan." "We met at 12:30 p.m. so we could have plenty of time to rehearse and iron out any issues by the 2:00 p.m. start of the service." At the rehearsal, Michael took notes and asked questions of the Bishop. After the rehearsal, he made final preparations for the service and then ran to participate in the final part of the choir rehearsal. For this event, Michael made a small change to the start of the service. "Normally, we gather 5 minutes before the start of the service, but I wanted folks to be in place 10 minutes prior, and it was worth it! It's a lot of people to assemble, and those things just take more time with larger groups." Once the opening hymn started and they started the procession, "The service went like clockwork!" Michael says. The rehearsal really helped get the participants focused, and there was very little Michael had to worry about. "One of the most gratifying things about the whole service - apart from seeing it go so smoothly - happened during the reception. One of the visiting clergy from a neighboring parish complimented me on what a good I did organizing," Michael recalls. "Hearing that from a clergy member outside of our parish really made me feel good about the work that I did and continue to do at my home church." So what is Michael's advice for vergers organizing an ordination? "Be flexible, be patient, and be early!"